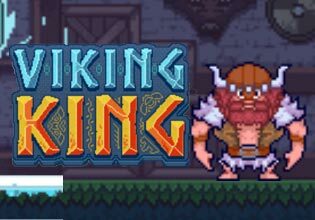 Viking King is a fast paced arcade game in which the player tries to avoid Odin's wrath. The allfather is smashing down fists to slay the mortals and he is raining down ice and fire on them. But luckily these Swedish pagans are forged in Valhalla by the hammer of Thor himself and so they can nimbly avoid attacks. The game gets faster and faster while Odin gets more and more angry. But fear not, you know if you fall your comrades await in Valhalla! Do not hesitate to play Viking King now, it is completely free and the first Viking to the battle will also be the first to the feast!